and protect your investment for tomorrow. During this inspection underneath the home, it was found that this load bearing post was inappropriately repaired with a rock to provide support. Posts should be sitting flat, on level footings, with termite pans protecting against infestation. It was recommended that these changes be made. This house was on a hill and was showing evidence of sliding down the hill. The lot needed to be re-graded and gutters be re-diverted so that water did not flow under the house. Without these repairs this house will collapse. During an inspection of this attic, extensive damage from wood-eating insects was found. This scale of damage to the home's roofing structure poses a huge risk of the roof collapsing because these posts and beams hold up the roof. Upon exterior inspection of the roof, the surface was found sagging throughout. 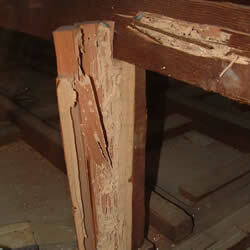 It was highly recommended that the posts and beams in the attic be repaired or replaced and insects destroyed. While inspecting the basement in the crawl space of this house, this crack was discovered in the foundation wall. There was also evidence of foundation repair in other areas of this house. 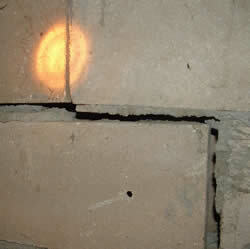 This crack can lead to shifting of the house and foundation. 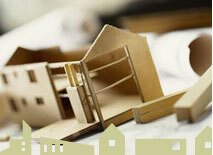 With monitoring it will be evident if the repairs made were sufficient in stabilizing the shifting.